I was in a little bit of a crochet rut this week and looking for something inspiring. Always on a hunt for a way to use the left over bits of yarn I have lying around everywhere. 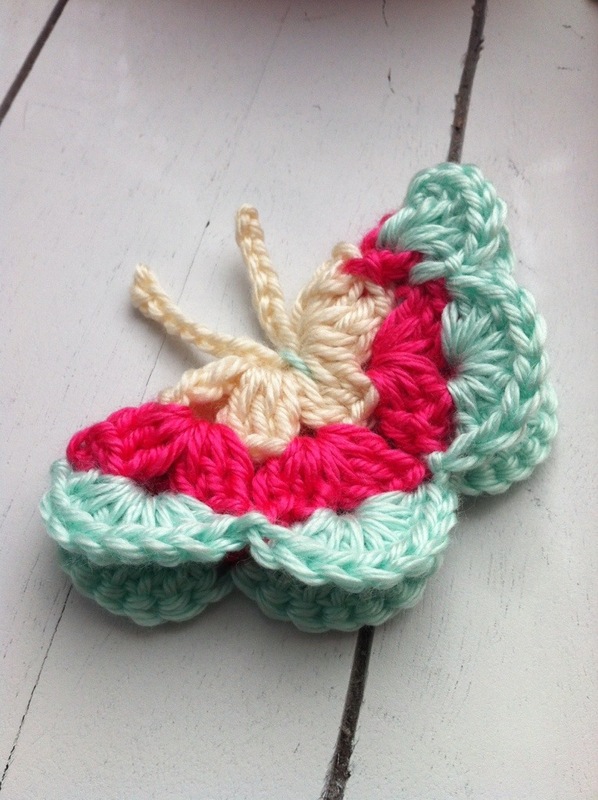 I came across this post at Marie’s Making Blog where she has the most creative pattern for a crochet butterfly! It is not the typical flat crochet motif. It is basically an 8 petaled flower folded in half. This allows for more structure and a 3 dimensional look to the butterfly. I LOVE LOVE the idea and started making my tiny balls of yarn scraps disappear right away! The “antennae” are the perfect finishing touch. My daughter loves to crochet. I can’t wait to show her your projects. Thanks for sharing. So cute!! I love the 3D effect they have. I Love these! But cant get directions to make them? Hi this web page is no longer available. Where can I get the pattern? It appears the original post is no longer available but I have posted another link to one very similar. Love your chunky and granny versions, this is a fabulous little project to whip up as a little gift (a pin or hair band) or to add to winter decorations when the spring bug hits! thanks for sharing! The blog is not existing anymore 😦 Are you able to attach the instructions here or email them to me? ohh noo! Let me take a look and see if I can find my translated version of the pattern and if I do I will add it to the post. I would love this pattern too! I’ve looked all over and can’t get the instructions. These are so cute! Do you still happen to have a copy of this pattern? as her blog no longer exists 😦 You’ve stated you’ve updated above but I cant see anything thats been updated. I’m sorry! Let me double check the update and the pattern I have. Ok, I don’t have my notes of the pattern with me right now but don’t want you to wait any longer… here is another blogger who posted a very similar butterfly pattern. Feel free to head on over there and take a peek. I will re-write my notes and upload them to this post once again for all to see. Hope that helps for now! Thank you so much for this, I’ll keep stopping by as normal and keep an eye out for your update! did you ever get around to finding and writing the pattern? hope it works for you as I found it straightforward, however I couldn’t navigate to other pages very well. Such a pretty project – ingenious – I hope Marie realises how well she’s done creating this. Thank you so much for posting the updated link!!! Thanks so much for sharing these little butterflies give a finishing touch to my projects! You are a dream come true.i love to crochet and you all give me never ending ideas LOVE YOU!